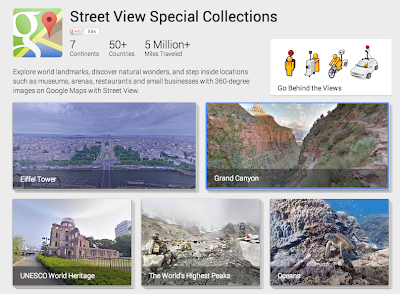 , a new site that highlights some of our most popular Street View collections and enables you to explore user-contributed photo spheres from around the world. Starting today, to complement the beautiful panoramas you see there, we’re also adding useful information about some of the featured locations, and behind-the-scenes stories about what collecting imagery of these places was like. From the Street View Special Collections page where you can browse imagery that transports you from the top of Mount Fuji to the top of the Eiffel Tower, simply click on the “Go Behind the Views” icon to access this additional content. The photography, video, audio tours and more provide a deeper understanding and appreciation for some of the most remarkable places on Earth. Want to hear the snow crunch under your feet as you hike the Canadian Arctic, or conquer your fear of heights by standing in the window washing basket on the 80th floor of the world’s tallest building? Now you can. Our first two multimedia adventures enable you to experience the Canadian Arctic in Iqaluit, Canada, and the world’s tallest building, the Burj Khalifa in Dubai, UAE. We also invite you enjoy photos and videos from our past journeys to the Grand Canyon, the base camp of Mount Everest, the Amazon Basin, the Great Barrier Reef and the NASA Kennedy Space Center -- minus the extreme temperatures and long plane rides! If you’re on the Views page for those specific collections, just click on the “About this place” button on the upper right hand corner. As we trek around collecting more imagery of interesting places across the globe, we’ll continue to add more content to these sections of the Views site. 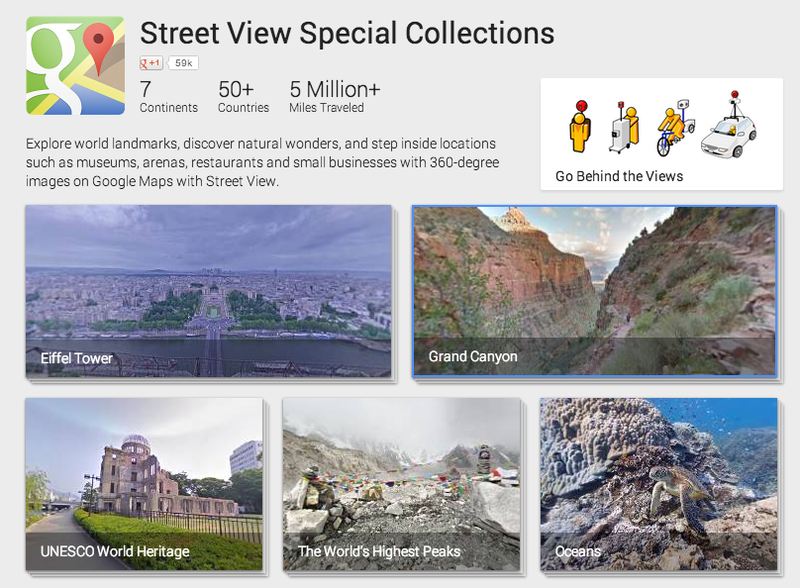 So come back often to check them out, get behind-the-scenes insight into how Street View imagery is collected, and learn fun facts and details about these select locations. 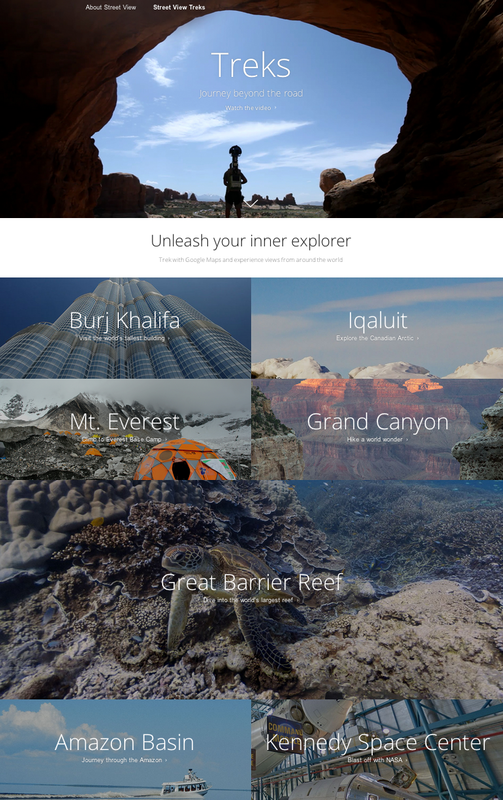 We hope trekking with Google Maps inspires you to explore unique places and celebrate the beauty of our world. Stay tuned for more interactive experiences to come and happy virtual travels! We recently launched Views, a new site that highlights some of our most popular Street View collections and enables you to explore user-contributed photo spheres from around the world. Starting today, to complement the beautiful panoramas you see there, we’re also adding useful information about some of the featured locations, and behind-the-scenes stories about what collecting imagery of these places was like.